If you’ve been following my decorating adventures for any time at all, then you know that my main goal is to inspire you to create a home that you love on a budget. In fact, my mantra is “Creating ‘home’ doesn’t have to be expensive and I’m here to prove it!”. Now that we’re in the throes of some of the hottest days of summer, I find myself craving calm, serene and relaxed spaces. Nobody wants formal and stuffy when it’s so hot outside! 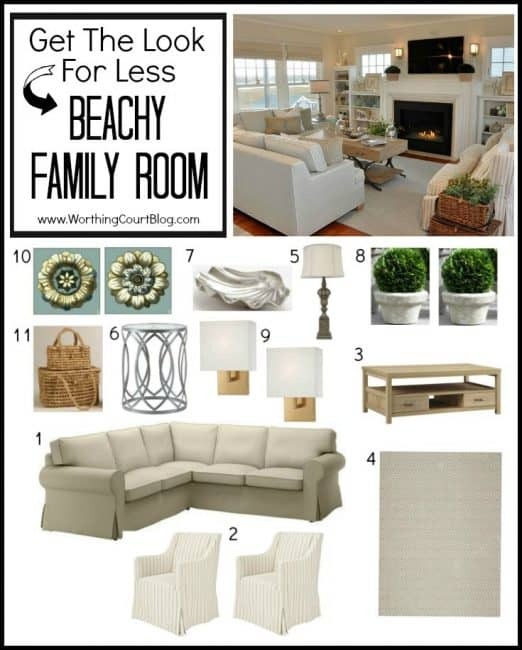 This beachy family room is the perfect example of what I’m talking about. With a fire in the fireplace, I know that this is a look that I could live with year round. So…I scoured the web to find some great deals so that you can create this same look on a budget. So what do think? Is this a room that you could live in? I love the serenity of it. I could be totally comfortable. I really like the clean lines of the furniture and I really like your paint colors. Will you share what you used? I am always in a quandary with colors. Love what you’ve done. Hi Marisa. Sadly, this is not a room in my house. :/ It’s an image that I found on Casabella Interiors’ website that I thought would be fun to recreate the look of on a budget. So…I’m afraid that I can’t help you out with the paint colors that they used. Maybe you could click on the link (below the photo of the room) and contact the design firm to see if they would share the colors with you. Sorry I couldn’t help! So cute! My husband and I have the Ektorp sectional and we love it. Such good bang for your buck! Thanks for sharing these good ideas! Love the inspiration … I’ve seen that beautiful room all over Pinterest and stop and stare at it each and every time! 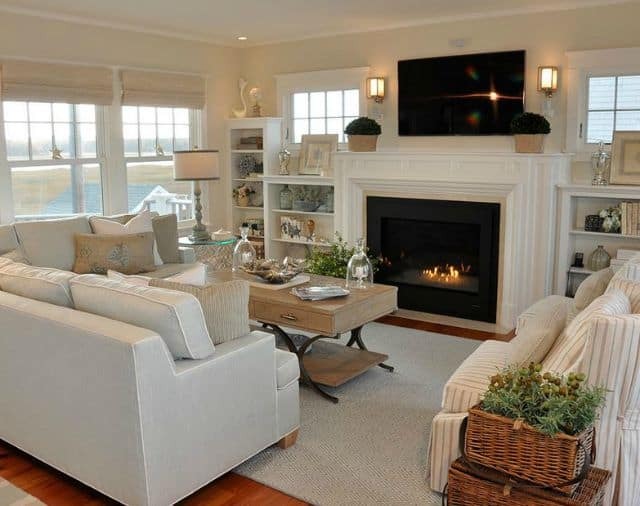 Such a comfy, cozy, fresh and inviting space! I love me some IKEA, especially the EKTORP line … love our EKTORP sofa and comfy chairs and hope to add a sectional downstairs someday, too! Thanks for sharing. Found you from the link up. These are great ways to create that beachy coastal fee. I’m pinning this! I am visiting you from Two Uses Tuesday! I love an all white or mostly all white room. This is lovely! I have one in my home. Love the clean neutrals! 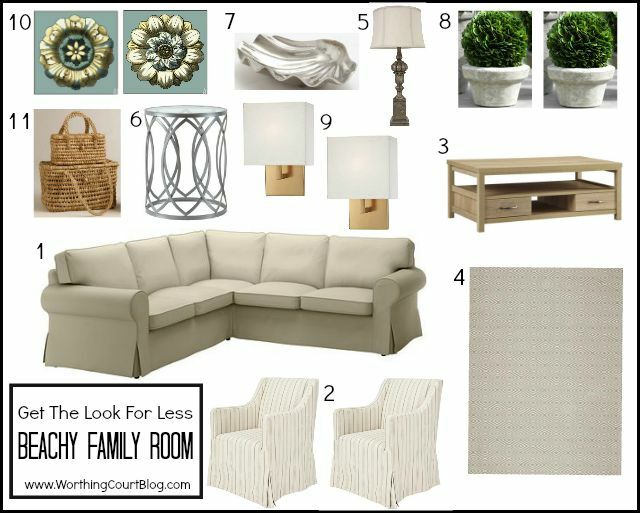 My husband had a brown couch when we got married, and I’m dying for something a little lighter. Love the sectional!